Academic proficiency is the touchstone of any accomplished legal professional. In recognition of this proposition, the University�s Halls of Learning, popular among students by the name �ACAD BLOCK� provides the requisite infrastructure and the desired ambience needed for quality legal learning. The gates of the Halls of Learning have the Preamble inscribed on them which in a very sub-conscious manner continue to remind the students of the core values of the Indian legal framework. 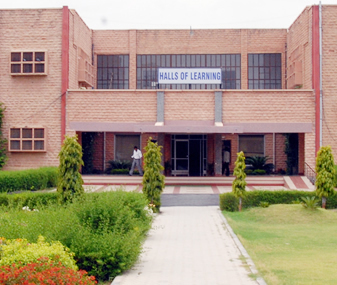 The Halls of Learning include all classrooms, each of which are equipped with projectors and air-conditioners, comfortable faculty offices, which are accessible to the students, the Conference Hall, which has been the venue of the most important symposiums, seminars, conferences and lectures conducted by the University and Moot Court Halls. At a mere three minute brisk walk distance from the Halls of Residence, the Halls of Learning provides the right kind of atmosphere to facilitate holistic education. The field of law is ever-evolving and even a life devoted to its study is not sufficient to have a complete grasp over all its facets. 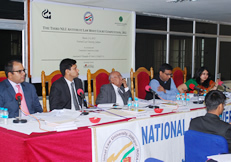 At NLUJ, the students are given a platform to imbibe the art of its interpretation. The University provides to its students air-conditioned classrooms with comfortable seating arrangement. Each classroom has a slide-projector attached which has reaped immense benefits to the students through the medium of e-learning. The University has some of the most distinguished luminaries as its faculty and with such arrangements the teacher-student interaction and consequent intellectual gain for the students is thoroughly boosted. For a comprehensive understanding of law, there is need to master not just concept but also its manner and actual practice. By including CREs as a mode of evaluation, the University intends to make them confident, emphatic and competent guardians of law. In furtherance of this objective, two Moot Court Rooms have been made in the Halls of Learning, each of which is an exact replica of the Actual Court. These rooms are used not just during the Court Room Exercises but also during the Anti-Trust Inter-University Moot conducted by the University and during the intra universtiy mooting competitions held on various occasions in the Semester. It is our strong conviction that learning is not to be confined to classroom learning. The University very pro-actively hosts various seminars, conferences, symposiums and guest lectures on diverse areas of law and contemporary relevance. The venue for all of these is the Conference Hall, which is a spacious Hall which can easily accommodate over 275 people. 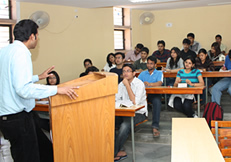 Given the pro-activity of our Students and professors, the available infrastructure of this Air conditioned, projector equipped Hall is used almost weekly by the University. The 21st century is that of technology. Acknowledging this new way of life and learning, the University has synchronized its teaching methodology with various online portals like Manupatra and Westlaw which are the online treatises on all facets of law. These have a detailed record of the contemporary developments in law as they store recent judgments. Hence by facilitating the case-law method of teaching the students are given a practical perspective of the concepts which they learn. Ours is one of those few Universities which provide for growth of both scientific temper and legal proficiency. In furtherance of our B.Sc.,LLB (Hons.) 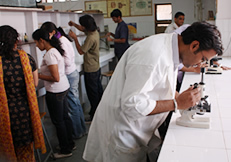 course, we have provided for fully furnished laboratories to ensure that the students acquire practical learning not just in law but also in the affiliated science subjects. Located just behind the office of the Honorable Vice Chancellor, the Board Room is a Hall which can accommodate around 50 people. Fully Air-Conditioned and furnished with a round table, audio-system and projector, the room is used often for conducting some important meetings as regards the University decision making process. Proper hostel facilities are a direct ingredient of the well being of students. The University has placed immense premium not just on the infrastructure in t he Halls of Learning but also in Halls of Residence. Every student has been allotted individual rooms with adequate space for a cupboard and a table and chair with an attached balcony. The students are allowed to keep a cooler as per their convenience. Apart from these, a student can avail the facility of getting his room cleaned daily, if need be. The toilets and washrooms are shared in the hostels, with one compound for the same on every floor. Moreover, a water cooler has been placed in the pantry of every floor except the ground floor and the top floor. A woman who does the laundry regularly visits the hostels. Nonetheless, the students have also been allowed to purchase and operate a washing machine on each floor. All the facilities mentioned for boys extend to the girls� hostel as well. The compound is built separately from the Boys Hostel, with a specific entry gate to ensure their safety and well being. Both hostels have sufficient proximity to the mess. In our nation, good food is what drives us from mere sustenance to thriving. The University has hired two caterers to provide food to its students on a pay-and-eat basis. Through this mechanism, the students get the opportunity to choose their food for every meal, as the two caterers provide a menu for every meal ie. breakfast, lunch and dinner. Apart from this one mess also provides non-vegetarian food on a daily basis. The mess is open from 7:30 am in the morning till 10:30 pm in the evening. Students can choose when they want to have ice-creams and wafers as they are available 24*7. Health and fitness is an important part of living a balanced life. The University has therefore made provisions of a well maintained Gym and able Gym Instructor. All sophisticated equipment needed for the purpose has been provided by the University. Gym facilities have been created separately for boys and girls. The University has the facility of an indoor badminton court open till 10pm daily, furnished with a proper lighting mechanism (which makes playing late evening comfortable and convenient) and synthetic track. The court serves the purpose of being the perfect stress-buster for students. Near the hostels and adjacent to the indoor badminton court is situated our cultural complex which is spacious, has the pantry, water-cooler and green room facility and is used frequently for practicing for cultural events. It works towards fostering holistic development of the individual. Health care services are the prime concern of the parents when they leave their wards at their home away from home. At National Law University Jodhpur we have a proper medical centre, with facilities to meet any emergency situation when need be. A qualified Doctor visits the Centre for Medical Care daily between 5-6 pm. The Centre is well equipped with all the basic medicines which may be required to cater to minor medical needs. These services are available 24*7. National Law University Jodhpur is frequently visited by many guest lecturers, analysts, scholars and family members of our students. 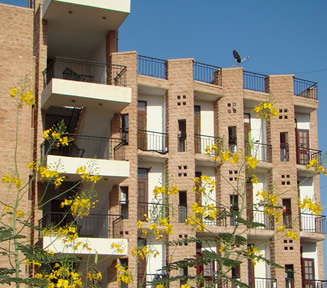 For their convenient stay, the University has made complete residential arrangements within the campus. The Guest House has spacious rooms, air- conditioned and properly ventilated, ready to play host for your stay on campus. National Law University Jodhpur Campus has a State Bank of India Branch located in its community center for the fiscal convenience of the students. The branch provides all banking facilities to the students to ensure that they do not have to visit the city for the same. The Auditorium enjoys the sheer distinction of being one of the most well equipped, most acoustic friendly auditoriums in the state of Rajasthan with a seating capacity of 250. The auditorium is designed with international benchmarks of acoustics and multimedia and it is a unique specimen of state of the art technology and facilities. NLUJ Advocates� Academy is an important component of NLUJ�s continuing legal education endeavor. Constructed with the help of financial assistance from Government of Rajasthan & Rajasthan Bar Council, it is the site for organizing continuing legal education programmes. The space between Halls of Learning and Halls of Learning (Extension) has the beautiful and aesthetically pleasing ampi theatre for outdoor performances and open air shows. A learned, responsive and robust faculty is the fulcrum of ensuring legal learning. The University has on its panel a very distinguished set of legal professionals as professors and has accordingly made arrangements for their chambers in the Halls of Learning. Each faculty chamber has a sound internet connection, spacious seating arrangement, filing arrangement and a common faculty pantry. 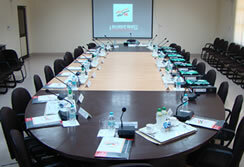 Attached with the faculty complex is the Meeting Hall where all the faculty meetings take place. Very accessible to the students, these chambers ensure that or qualified faculty remains engaged with the University. Adequate facility for accommodation is also provided to all the Faculty members and fully furnished staff quarters are available on campus. The University Guest House and NLU House are adequately equipped for University dignitaries and visitors. All residential blocks are equipped with a cable connection, campus LAN and the internet. Small facilities are of grave significance in daily student life at hostel. Keeping this in mind, the University has made provisions for a general store near the hostels to cater to the students' requirements of all facilities needed to make a proper living outside home. It opens daily till late evening. 3. State-of-the-art audio-visual facilities in lecture theaters and classrooms. 4. Internet browsing facilities and integrated e-mail system accessible from anywhere in the campus. 7. The NLU website for in depth information on the University and its current activities. 8. Unique Placement portal for collaboration between graduating students, career services office and prospective employers. Library block has a well-equipped computer lab with latest configuration. It has 1 Gbps Internet facilities. IT facilitates faculty members & students to explore online libraries and knowledge resources. National Law University Jodhpur is 12 kms away from the main city. Yet transport is not a problem as commutation is facilitated by the university bus, which plies daily from the campus to the city atleast 5 times both in the morning and in the evening at specific timings. As the University is situated on NH-65, city buses can be easily access from just outside the University in a interval of 15 minutes. Moreover, autos are easily available from outside the University campus. To facilitate organisation of round table conferences, symposia, orientation programmes and workshops, the University has constructed a state-of-art convention centre with boardrooms, suites and guest rooms.